Pittsburgh Underground: Movies That Have Everything: Special Screening of Tales of Poe Screening THIS FRIDAY!!! Movies That Have Everything: Special Screening of Tales of Poe Screening THIS FRIDAY!!! Do you hear it? As of someone gently rapping, rapping at your chamber door? A very special one night only screening of the award winning film, Tales of Poe will be premiering this Friday, October 10, 2014 at The Hollywood Theater (1449 Potomac Ave., Dormont, PA / 412 563 0368). Doors will open at 7 PM with screening at 7:30 PM. Admission is $8 for adults and $6 for seniors and students with ID. Tickets may be purchased in advance at Showclix or or at the door. Check out the trailer below! This will be the first theatrical screening of Tales of Poe on the East Coast. The world premiere of the film was held at Grauman’s Egyptian Theater in Hollywood, CA in August 2014. Based on the classic works of Edgar Allan Poe, directors Bart Mastronardi and Alan Rowe Kelly have assembled an award-winning cast and crew in Tales of Poe. A unique new spin on three of Poe’s popular stories (The Tell Tale Heart, The Cask of Amontillado and Dreams), Mastronadi and Kelly weave together a compelling and suspenseful anthology that will captivate Poe enthusiasts and horror fans alike. The anthology boasts a cast of genre greats that includes Adrienne King, Amy Steel, Caroline Williams, Debbie Rochon, Lesleh Donaldson, Randy Jones, Desiree Gould, Brewster McCall, Alan Rowe Kelly, Bette Cassatt and Cartier Williams. The film was written by Kelly, Mastronardi and former Pittsburgh resident Michael Varrati. Director Alan Rowe Kelly, along with actress Bette Cassat co-executive producers Amy Lynn Best and Mike Watt (both of whom appear in the film segment The Tell Tale Heart), will be on hand to meet and greet fans before the screening. There will be a brief Q&A session following the film. 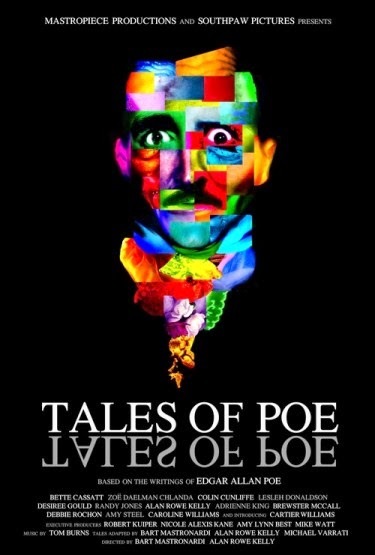 Tales of Poe represents true independent filmmaking. Following three years of production, the producers have assembled a dream cast, designed sets and costumes, and adapted their screenplays from a master story-teller. With financial support coming mainly through crowd funding campaigns, the filmmakers were able to maintain the film's artistic integrity and complete it on their own terms and agreements. Remember gang - this is a one night only event! To learn more about the film, visit the Official Tales of Poe Website and as always, don't forget to check out the Official Hollywood Theater Website for this and other great events as we scare through the Halloween season! The Hollywood Theater has embraced and supported independent films, including those in the horror genre, since opening under new management as a non-profit community theater in May 2011. In partnership with Horror Realm, Pittsburgh’s modern horror convention (www.horrorrealmcon.com), the theater has offered opportunities for independent horror filmmakers to show their work on the “big screen” in a welcoming and affordable manner. The venue is a non-profit 280-seat single screen theater located at 1449 Potomac Avenue in Dormont, just a few miles south of downtown Pittsburgh. The theater features repertory and independent films as well as special events such as art shows and fundraisers. Contact the theater at 412-563-0368 or www.thehollywooddormont.org for details on upcoming shows or to rent the theater for your party or event.